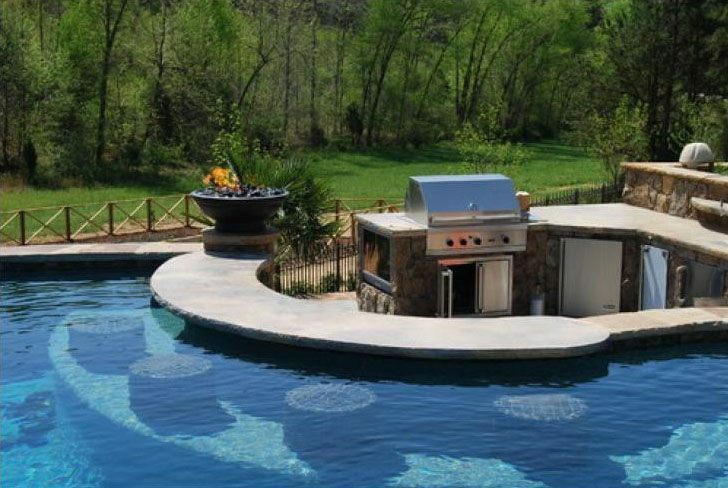 Are you ready to see 20 of the most amazing backyard pools on the face of the planet? Most of us can only dream about having a resort like pool in our yard, but these swimming holes will give you some inspiration in case you ever end up winning the lottery. I’m curious to see which one is everyone’s favorite. Post a comment at the bottom and let me know which one you think is the most incredible. #1. This pool is my absolute favorite. 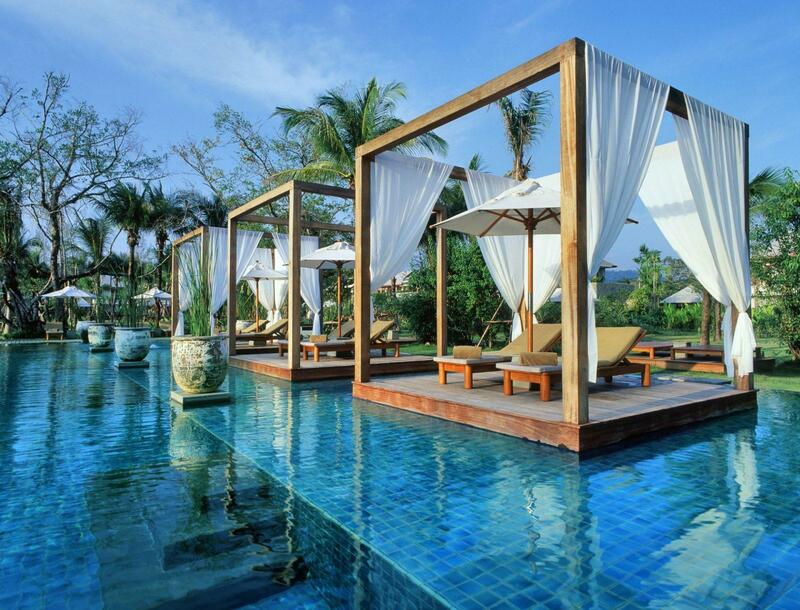 It may actually be at a resort pool, but the floating cabanas are sweet. #2 This pool has a lot of nice natural stone work and a cool waterfall that pours from the spa into the pool below. 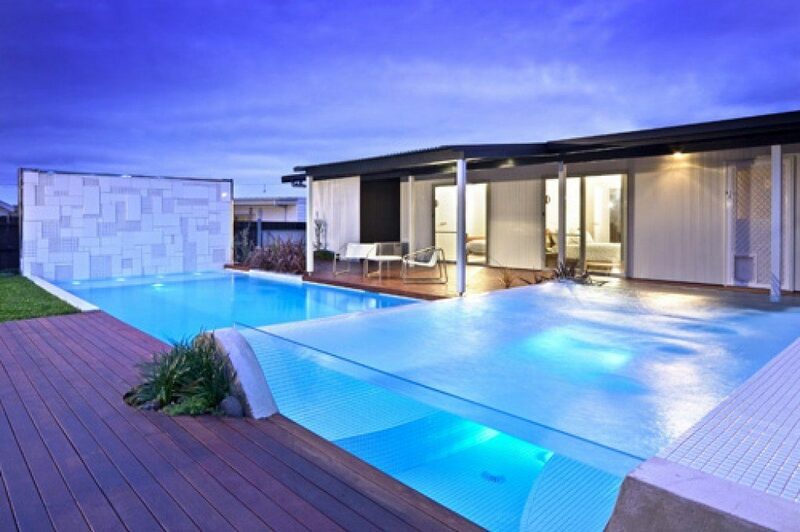 #3 If you like modern and futuristic, this is the pool for you. 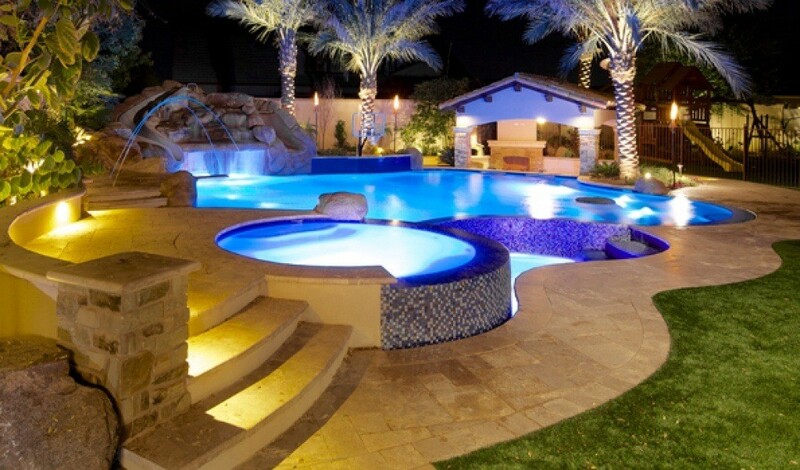 Multiple level pools with led lights everywhere make this an amazing one of a kind pool. #4 Who doesn’t like a swim up bar? The combination of the pool bar and outdoor kitchen make this backyard an entertainers dream. 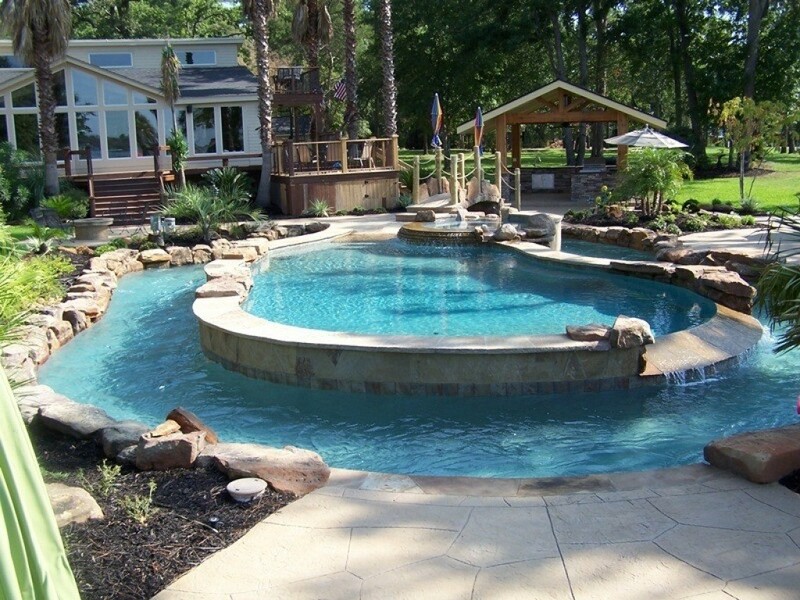 #5 It’s not often you see a lazy river built into a backyard pool, but these folks have one. Add in a nice spa, waterfalls and outdoor kitchen area and this is one fabulous area to hang out. #6 Ok, this entire set up is just off the charts. 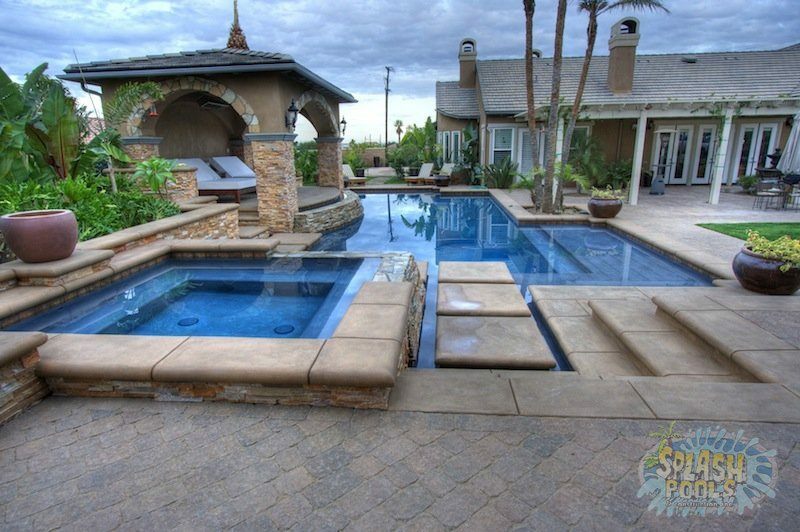 Amazing house, pool with bridge and sunken fire pit, plus a water slide and lower pool area. It doesn’t get much better than this. Better buy that Power Ball ticket. 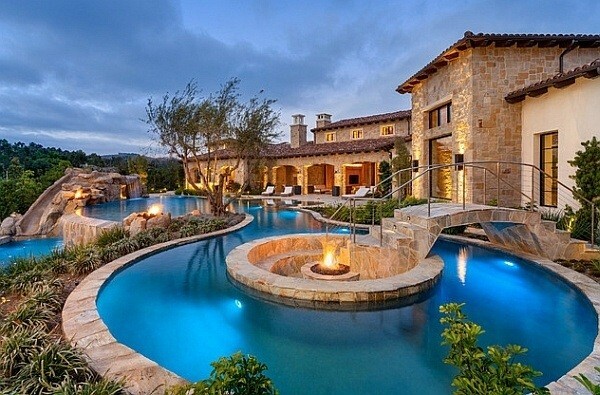 #7 This is a really nice pool design. The concrete work is perfect and the cabana with the lounge chairs looks like an amazing place to relax. This is one of my favorites. #8 What I really like about this pool is how much they fit into a small space. 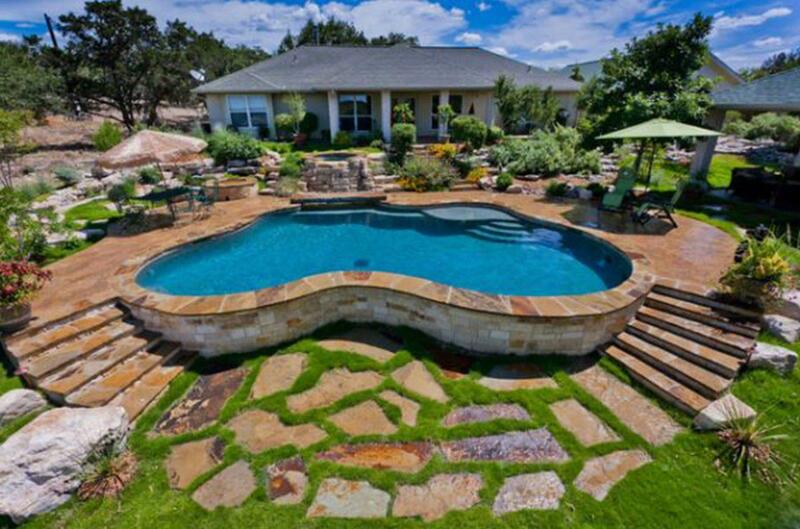 Sure it’s just a small lap pool, but the stone wall with water features definitely makes is special. #9 This pool has all the tricks. 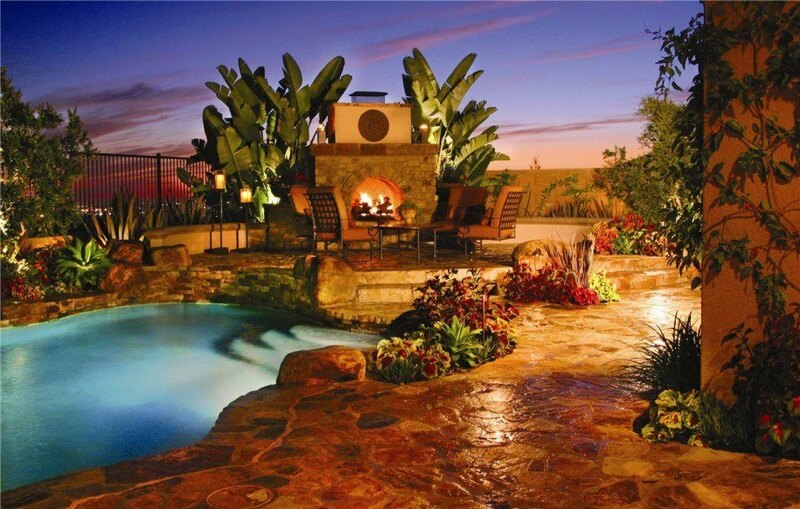 Fire feature, fire pit, waterfalls, a beautiful spa and amazing landscaping. This is a beautiful entertaining pool & backyard. #10 Ok, for a minute I was waiting for Shamu to swim up to the glass wall and splash the front row. It’s not often you see a pool with a clear wall like this. 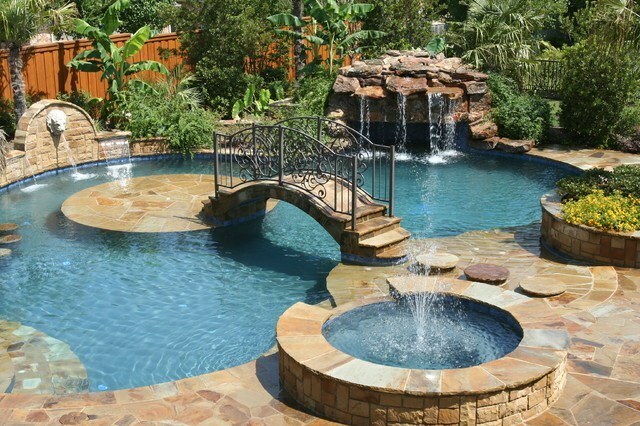 It’s definitely a special pool with nice stone work, waterfall and deck area. #11 This pool is a tropical oasis in someones backyard. 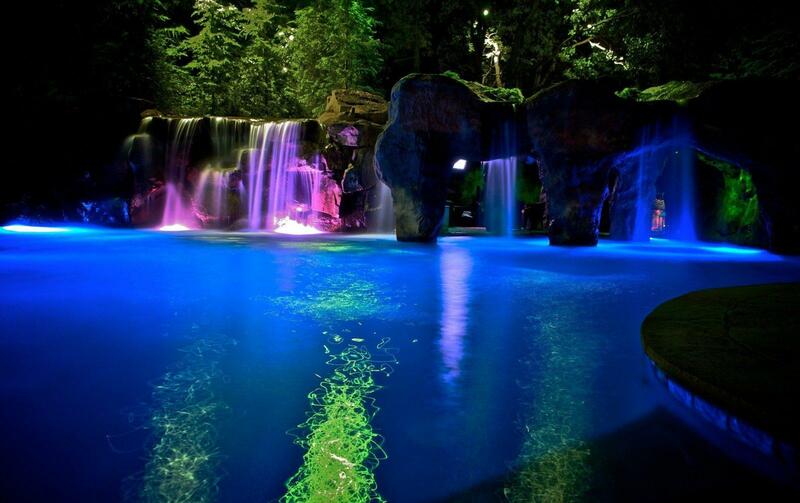 I love the waterfall and grotto area. They also included another feature wall with a lions head and more waterfalls. If that wasn’t enough, the island and spa with fountain are an added touch. #12 This is a unique pool design. 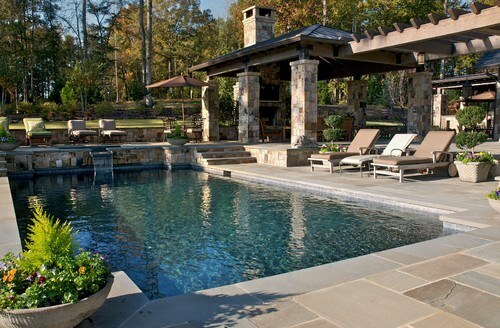 If you’re not a fan of natural stone, this may not be your favorite, but the pool and fireplace area are very elegant. Looks like a great place to hang out. #13 Check out how they ran the pool in between the 2 buildings and connected with a bridge. 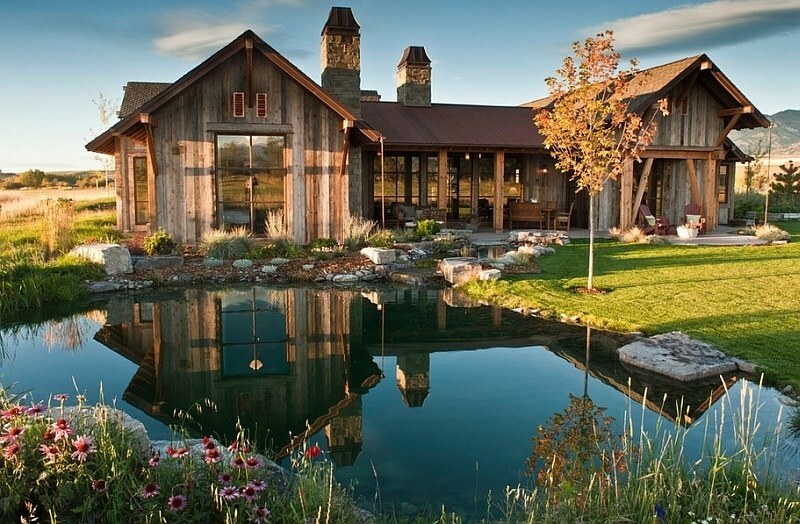 Really beautiful landscaping and home as well. #14 This is just a fun looking outdoor space. Love the LED lighting and the water jets. If you look in the back they also have a slide and a basketball hoop. Very cool. #15 WOW. This is a very interesting design. It looks like the right half of the pool is for lounging in the water with a deeper section on the left. Very clean and modern. #16 This is my kind of pool and entertaining area. I really like the enclosed top area with the TV and patio. The pool is simple with nice slate stone work. Well done. #17 You don’t see many indoor pools unless they’re in mega mansion type homes. I like the style of this pool. It’s simple and has nice stone elements. #19 Natural pools have become super popular in the past few years. Mainly because they don’t require all of the chemical and maintenance of a chlorine pool. 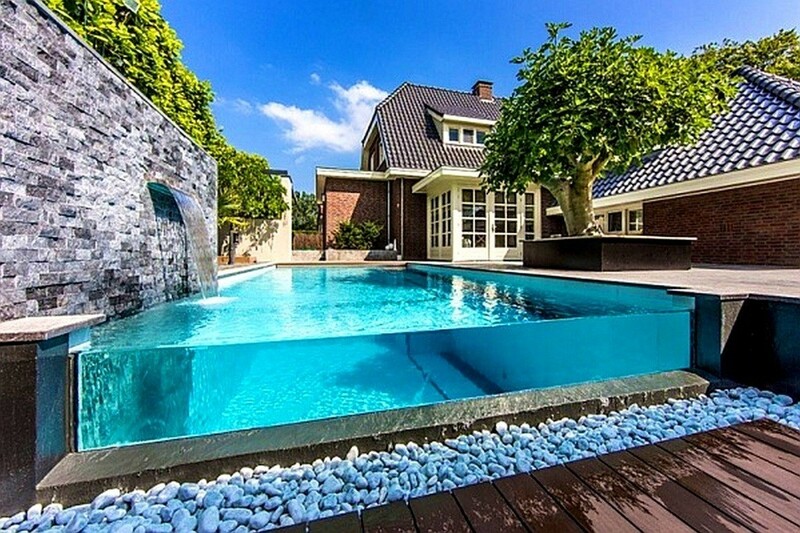 This pool looks like a small pond and is totally inviting. 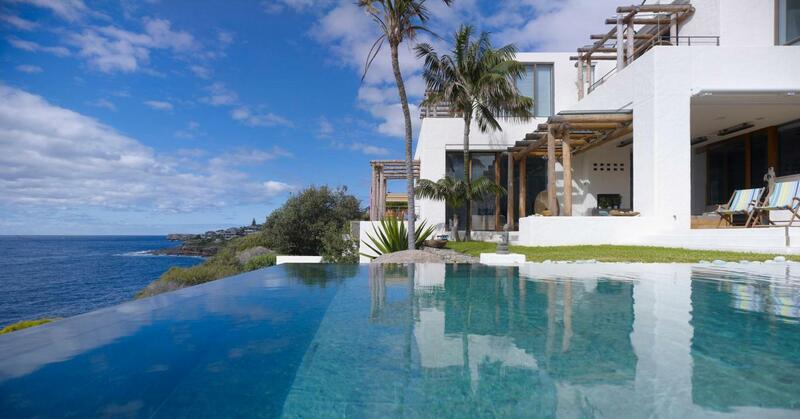 #20 This is a dream pool with an infinity edge over looking the ocean. It’s hard to tell where the pool stops and the ocean begins. I don’t know anyone who wouldn’t love to have this spot. 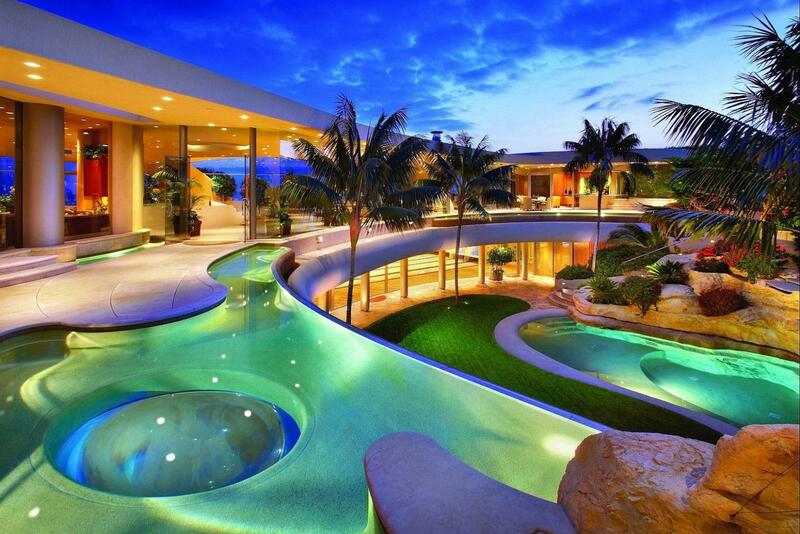 Wow, these are some awesome looking pools. 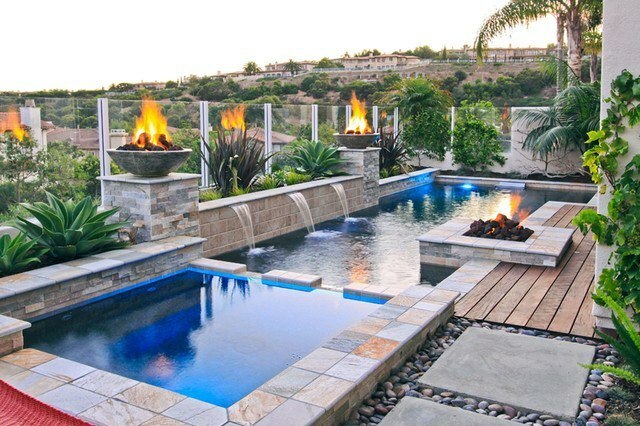 My favorite is #9 with the fire bowls above the water falls. Love to have something like this in our backyard.